You want ugly this is it, nice price and great fit as expected, bought as a gift, they loved it. Wearing this right now, fits great, very comfy, and have received multiple comments about how funny it is and unique. Extremely soft and high quality - will not shrink or itch. Our Christmas sweaters are made with high quality double-panel construction with reinforced seams. Machine washable and built to last. Looks like Santa had one too many egg nogs and decided it was time to spread some of his Christmas Cheer! Hopefully the neighborhood kids don't get any "bright" ideas! Made with 100% premiere acrylic yarn and machine-washable. 3.0 out of 5 starsDisappointed!!! I do enjoy that the length is just an inch or so longer than most sweaters, and the sleeves are NOT all super long as a result of that trade off, this is something as a 6'-2" person that I find tough to get the overall length just right without swimming in sleeves. The 'tipsy elves' nailed this one, sizing is spot on! I really wanted to like this sweater. The design was clever, and worth at least a 4, but the construction quality was dismal and worth about a 2, so I averaged them to a 3. 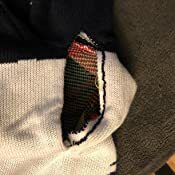 There were several stains/discolored areas on the front (that appeared to be embedded within the knit, not from something getting spilled on it) and the dark pieces (like sleeve and body) are stitched together with white thread that clearly shows (seams are very loose with visible gaps between pieces). I noticed several other reviewers saying these were smaller than expected. That did not seem to be the case with mine. Width was on par with the XXL's of several other brands of "ugly sweaters" I've ordered. If anything, it was a little too long in the body and sleeves (and I typically wear tall shirts/jackets). 5.0 out of 5 starsNo problems with color and fit. The sizing is exactly as advertized. A large is a little too small for me so I went with a XL and it fits like a sweater should, just a little on the comfortably loose side, without feeling like it's too big. Whatever you normally wear, go with that. If you wear a large t-shirt, order a large sweater and don't try to overdo it to accomodate the fact that it's a sweater. Colors are as you see in the picture. I had no issue with the yellow not being yellow and the red looking more like a rust color. it's as advertized. As far as the design goes, I haven't debuted this bad boy yet but I'm expecting everyone to love it, except my wife who has no sense of humor... at all. 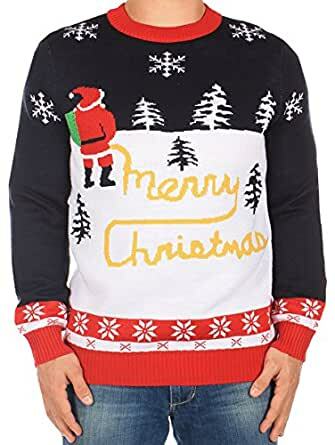 Got "ugly christmas sweaters" for my entire immediate family (and their SO's) for our annual (extended) family Christmas eve party. Unfortunately this year it was MUCH warmer than our normal winters, but that didn't spoil the fun. Each sweater represented a detail about the person wearing it. This one was for my fiance who idk...pees a lot? Lol he just liked this one and said this was the one he wanted so I got it for him. Just a heads up the yellow isn't as bright as in the picture. They were a hit and started a new family tradition! 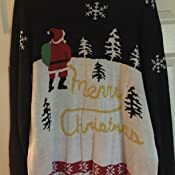 I ordered a large in the navy Yellow Snow Sweater, but unfortunately the elves must have been a little "Tipsy" because I received the wrong item. I received a medium gray Nutcracker Sweater...not even close! It did ship to me fast and the mistake made me realize the medium will fit me better. When I called customer service to see how to handle the exchange, I was on hold for 15 minutes before being transferred to voice mail. 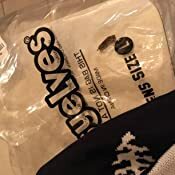 The sweater I did receive was great quality for the price, so I decided to give them one more chance and re-ordered the sweater I wanted and plan on sending the wrong item back. Update: reordered the item i originally ordered and received the correct item super fast. Like i said before, great quality item for the price! 1. Sweater is very well made. 2. The texture is that of sweaters from the 80s. Sorry but that is what comes to mind! 3. This one is more subtle than some other options. Kids did not seem to catch on! 4. Scratchy so be prepared to wear an under shirt if you are sensitive to that sort of thing. 5. Lots of laughs when someone actually realizes what is pictured!